As a member of the Garden Writers Association, various purveyors of garden-related products sometimes offer me samples of their products in the hopes that I will write about them. Last winter when the folks at Renee’s Garden offered me a number of free seed packets, I couldn’t resist. I had already ordered my vegetable seeds, and my few experiences with an occasional veggie packet from this firm had not been ideal. I assumed that because Renee’s Garden is based out of California, their veggie seeds were probably not ideally adapted to the heat and humidity of Piedmont summers. I don’t usually buy many annual flower seeds for budgetary reasons, but since these were free, I settled on 10 flower varieties from Renee’s Garden to trial in my garden. This company offers many heirloom seeds, so I thought I’d try some of those, and some that the catalog promised would attract butterflies. I’ll write a second blog entry soon to document the flowers I don’t describe here. Fragrant Moonflower — a vine that produces fragrant white morning-glory-type flowers that bloom at night. 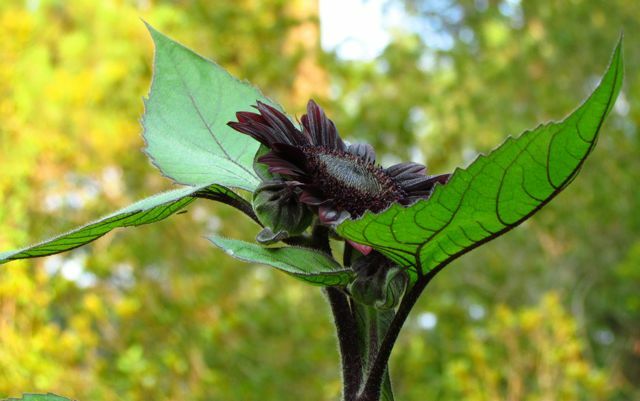 ‘Chocolate Cherry’ — an ornamental sunflower with “rich chocolate-burgundy ray petals that surround dark chocolate center disks”. 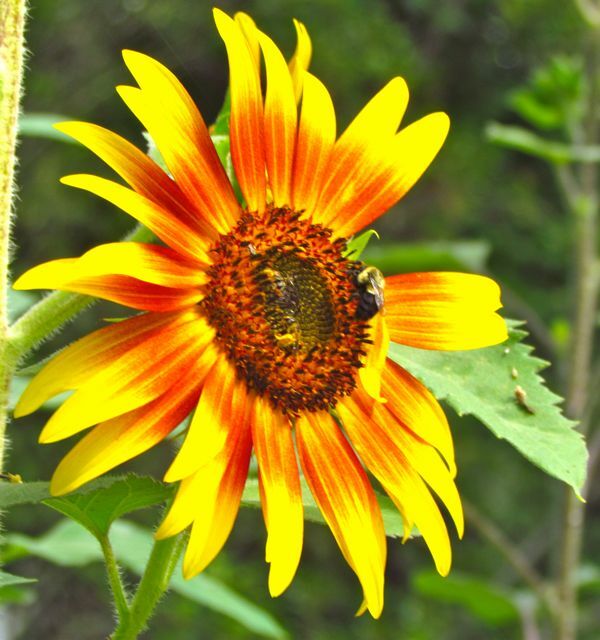 ‘Sun Samba’ — a colorful mix of sunflowers ideal for creating beautiful bouquets. 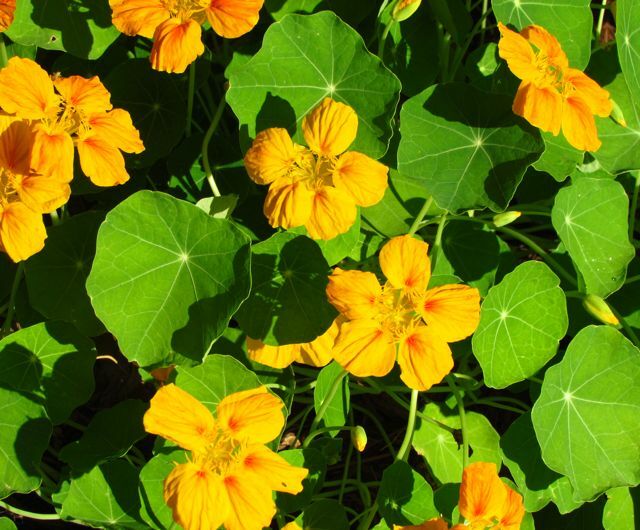 ‘Cup of Sun’ — a mounding nasturtium producing sunshine-colored flowers. ‘Spitfire’ — a climbing nasturtium with orange-red flowers attractive to hummingbirds. 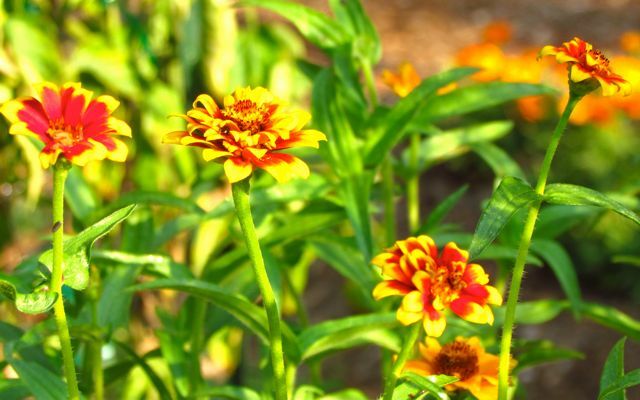 ‘Persian Carpet’ — a border zinnia mix of warm colors purported to attract butterflies. ‘Torch’ — a tithonia variety purported to draw butterflies, especially Monarchs. ‘Dancing Petticoats’ — a speciality mix of cosmos in shades of white, pink, and magenta. ‘Little Ladybirds’ — a smaller cosmos mix of sunshine colors purported to attract butterflies. 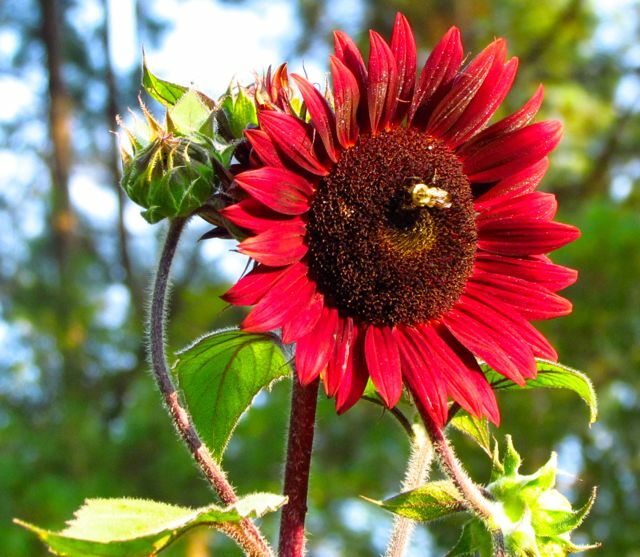 I also couldn’t resist one perennial offering: ‘Capuccino’ Rudbeckia — a Fleuroselect award winner in Europe that produces bicolor flowers in rich shades of red and yellow that is heat- and drought-tolerant and attractive to butterflies. 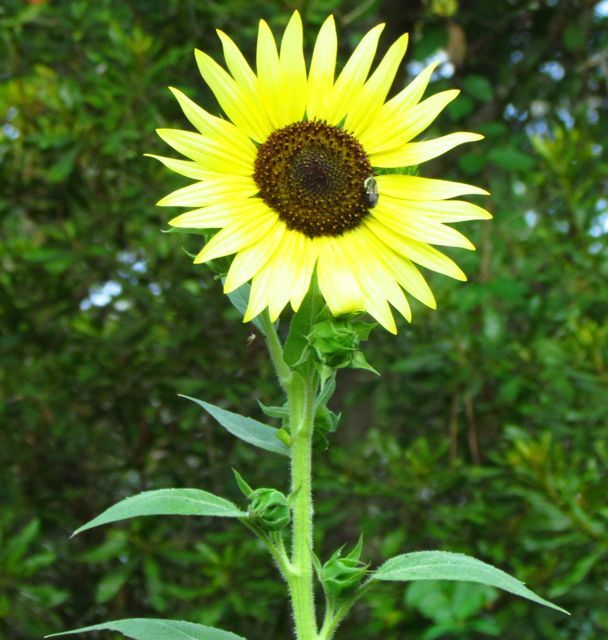 I direct-sowed the sunflowers and the moonflowers in my garden. The moonflowers got a late start, because it took me some time to prepare a place for them near a fence. They germinated well and are growing vigorously. I’ll update you on them with pictures when they bloom. The sunflowers germinated with great enthusiasm. Despite record heat and prolonged moderate drought, they continue to produce abundant flowers that the local bees can’t get enough of. The seed packets for these flowers suggest they make great bouquets, but I think I’d have a bee riot on my hands if I tried to cut them to bring inside. The ‘Sun Samba’ mix has been blooming for almost two months now. Some are just blooming for the first time this week, mostly because they decided to pretend they were trees, devoting much time to shooting skyward. 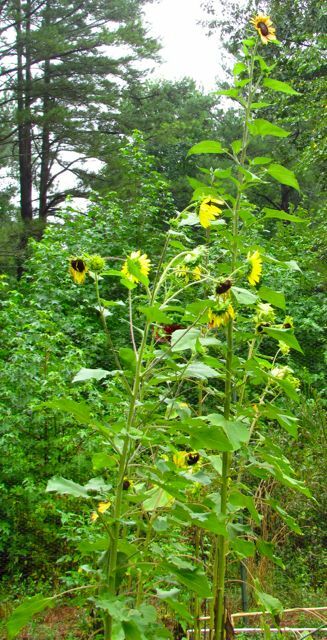 The seed packet for this variety says they’ll reach 5-7 feet, and that has mostly been true, but at least two of them are approaching ten feet. As proof, I offer you this photo taken today. Wonder Spouse is standing right next to the base of this sunflower. Wonder Spouse is 5’11”. This Sun Samba? You decide. Note the bumblebee coming in for a landing on the right side of this photo. They’re just so gosh-darned bright and sunny, aren’t they? 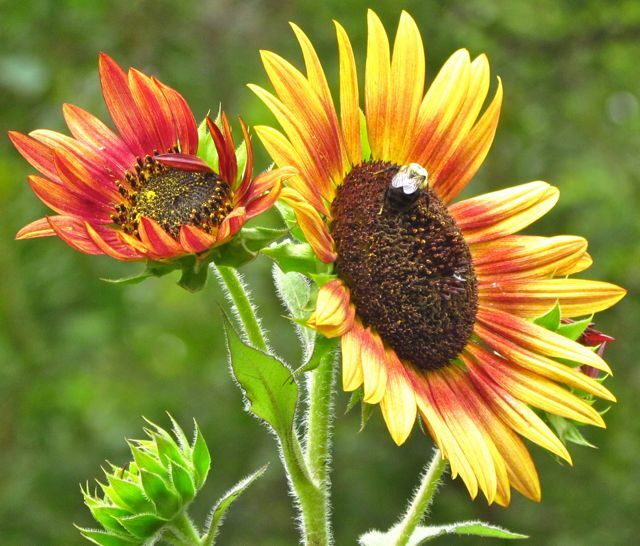 Flower color combinations vary even on the same plant. And to give you a bit of context, here’s a shot of most of the double row of Sun Sambas. Note the giants towering among the mix. The seed packet for zinnia ‘Persian Carpet’ says this mix attracts butterflies. Butterflies visit my garden often, but I’ve never seen one on these zinnias. 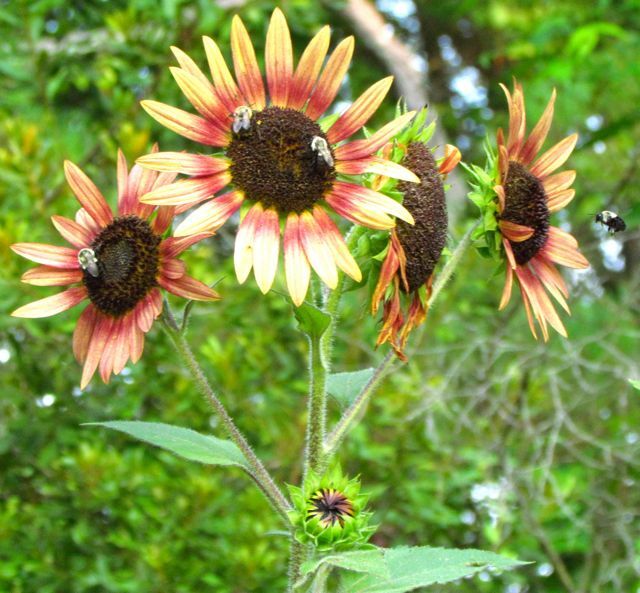 The bees, on the other hand, seem to like these bright flowers very much. The packet claims these flowers mature to a height of 1-1.5 feet; however, my zinnias are leggy and about three feet tall. I had to stake them to prevent them from flopping over. My flowers don’t vary as much in color or pattern as the image on the seed packet. I’m not sure I’d grow these again, given their awkward growth pattern and unpopularity with my butterflies. But they have laughed at the heat and drought, and that’s no small feat in my garden. This concludes Part 1 of my review. I’ll tell you all about the nasturtiums, cosmos varieties, tithonia, and rudbeckia soon. This entry was posted on July 22, 2012, 4:42 pm and is filed under piedmont gardening. You can follow any responses to this entry through RSS 2.0. You can skip to the end and leave a response. Pinging is currently not allowed.